Blake Island is situated approximately eight miles southwest of downtown Seattle in beautiful Puget Sound. Blake Island, Blake Island State Park. Photo courtesy Tillicum Village. Nestled between Bainbridge Island and Vashon Island, the 476-acre island once was privately owned and then in 1974 became Blake Island State Park. 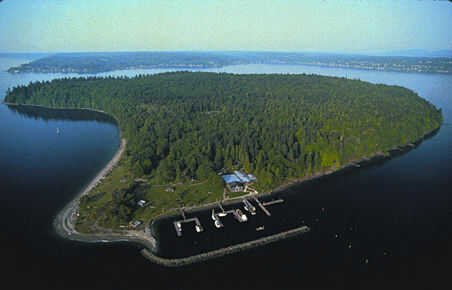 Blake Island is a favorite location for kayaking, bird watching and year-round camping. The popular Northwest attraction and tour, Tillicum Village, is located at the north end of the Island and is a daytime cultural attraction for visitors during the summer. The island's proximity to nearby Bremerton, Seattle, Tacoma and other surrounding cities makes it a prime destination for daytime and overnight vacations. Blake Island, which can only be reached by boat, features 15 miles of hiking and bike trails, three campgrounds and approximately 1700 feet of saltwater shoreline. An underwater park provides seasonal opportunities for clamming, crabbing, snorkeling and swimming. Wildlife-watching opportunities on the island include black tail deer, eagles, osprey, geese and other native animals. The island commands breathtaking views of the Olympic Mountains, Puget Sound and the Seattle skyline. The most popular method for reaching the island is via one of Tillicum Village's affiliated tour boats, which depart Seattle daily March to October. Public moorage is also available on a daytime or overnight basis for private boats. See our getting there page for more information.